So far, this spring is passing by in a happy blur. There's always something on the calendar and it's good to be busy and have things to look forward to so I can't complain. Even with things going on, we make time to cook, bake, and of course - eat! Nothing could be easier and more relaxing than making cookies so I'm dropping off a batch of chocolate chip cookies today. I seem to be on a chocolate chip cookie kick lately but as far as I'm concerned, it's always fun to try another chocolate chip cookie recipe and one cannot live by strawberries and raspberries alone no matter how good they are right now! This time, I tried to take a step back for a moment from those much-loved soft and chewy cookies to something different - thin and crispy cookies, studded with dark chocolate chips. Its dark brown hue hints at its deeper caramel flavor. These cookies were made from Tate's chocolate chip cookie recipe. Are you familiar with Tate's? They are known for their thin, distinctively crisp and crunchy, chocolate chip cookies and this is the recipe the owner, Kathleen King, shared in her cookbook for them. I've wanted to try this recipe at home for a while now because my son loves those Tate's cookies. I remember he first tried them a couple of years ago when we were out shopping and he was given a sample. He really took a liking to them. I was a little surprised but I shouldn't have been when I think about his preference for Oreo cookies and crunchy snacks in general (I think most of us can relate). So we're happily munching our way through this batch of cookies and leaving crumbs in our trail but are these homemade cookies like Tate's? Frankly, no. At least my batch wasn't. They sure are good cookies, with that nice familiar caramel flavor, but as far as comparison to the "real" thing, it's in the texture. Mine didn't have that same uniform, all-through serious crunch you get when you bite into one of those thin Tate's cookies. Baking a few extra minutes may be in order though I have to admit to a fear of veering too close to burnt rather than browned! But though the recipe doesn't turn out the same thing as the cookies from a Tate's bags, I can't say it was a wasted effort given the tasty flavor and well, the general goodness of homemade chocolate chip cookies, period. No one complained. A little further comparison...Tate's cookies, like the example you see below, have a very uniform thinness that I didn't quite achieve with mine. And they are indeed so crispy that it's usually hard to find a package without any broken cookies! My at-home version following the recipe is a bit thicker in the middle. The cookies are crispy, more so at the edges. If you're really looking for as much crunch as possible, be brave (braver than I am) and bake the cookies until they are more evenly browned in the center. The recipe calls for dark brown sugar, which didn't surprise me given the deeper color and flavor of the cookies, but I was surprised by the equal ratio of granulated to brown sugar. I expected more granulated sugar for a crispy cookie but I suppose brown sugar provides a lot of valuable flavor and we have to rely on the bake time to give us the texture we're looking for. All in all, I think baking chocolate chip cookies is always a good idea! You learn a little something new with each recipe, and you get a great snack in the bargain. In a large bowl, whisk flour, baking soda, and salt together. In the bowl of a stand mixer, cream the butter and sugars together. Add water and vanilla, and mix until just combined. Add eggs and mix together lightly to incorporate. Stir in the flour mixture. Fold in the chocolate chips. Do not overmix the dough. Drop cookies (I used a 1 1/2 tablespoon measure ice cream scoop) onto the baking sheets, about 2 inches apart. Bake cookies for 12 minutes or until edges and centers are brown (this may mean an extra couple of minutes bake time to ensure a crisper outcome), rotating the pans halfway through. Remove cookies to a wire rack to cool. What a great post - and I love how you have really explained the recipe and baking results. Happy spring! You definitely indulge me, Tricia. Thank you! Have a great weekend! I haven't had any cookies since Christmas time! I am craving yours now. 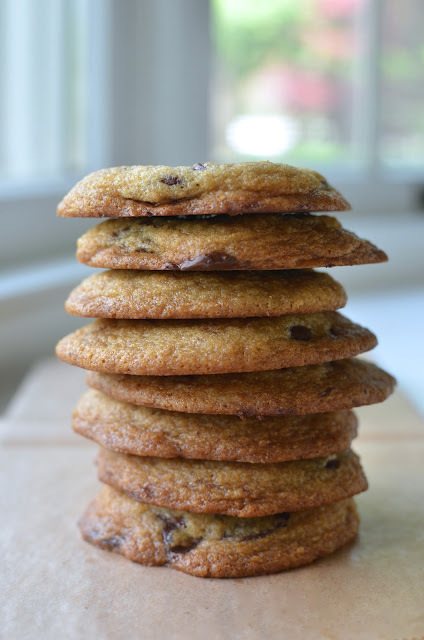 I love cookies with crisp edges and chewy center. These cookies fit the bill, Monica. It's definitely easy to turn these out in that way...a couple extra minutes for a more thorough crunch but I admit we do like that mix of texture. I had never had Tate's cookies until I visited my parents last summer ... they love them! I need to make an at home version for the next time they visit! Yay for chocolate chip cookies of any kind :) Have a great weekend Monica!! There is definitely a very serious following for those Tate's cookies. You really have to go out on a limb and bake these a couple extra minutes if you want them closer to the ones you buy! Enjoy the weekend! 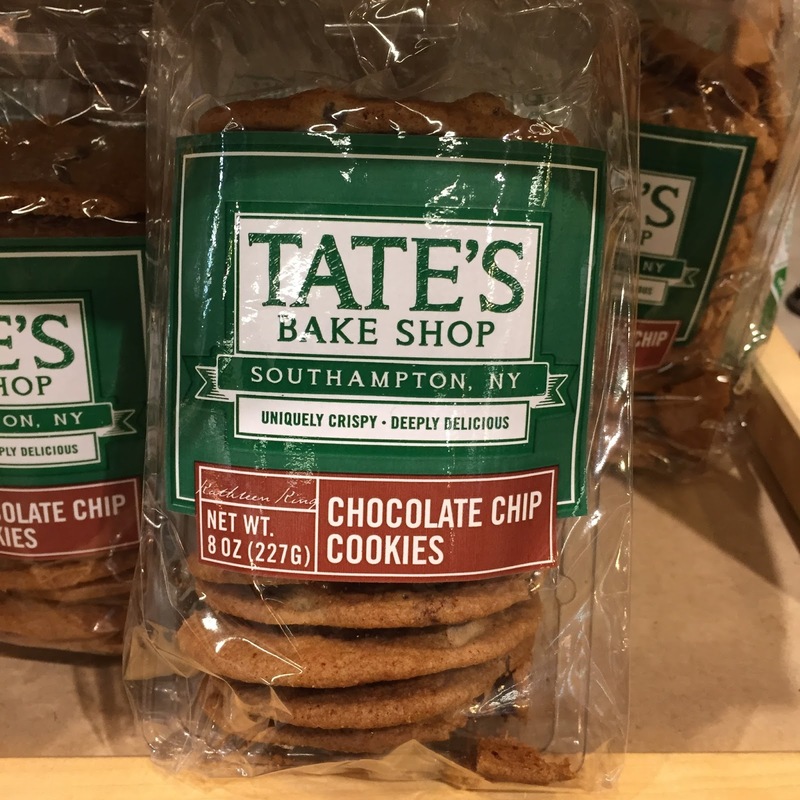 I have never had Tate's cookies but these look & sound delicious Monica! I love soft and chewy BUT thin cookies have their place too and they can also be so delicious. I remember my coconut cookies always come out thin crispy and chewy. Love the recipe! Ok here I was going to be a good girl and enjoy an apple whilst doing a little reading and here you have to go posting one of my favorite with not one but 2 sticks of butter... hmmm boring apple or a whole plate of Monica's cookies. I know which one I choose... LOL Have a super weekend! Your cookies look amazing to me! I don't know about Tate's cookies, but they've certainly inspired a delicious-looking post. You're very sweet - thanks, Beth. You can't go wrong with a chocolate chip cookie, these look delicious! Chocolate chip cookie cravings are too frequent and maybe too easy to satisfy. : ) It keeps life sweet though. Hi Monica, we are big chocolate chip eaters around here and I think it's wonderful there are so many different recipes out there with so many different kinds of textures. I would love a couple of these right now with a nice glass of milk. 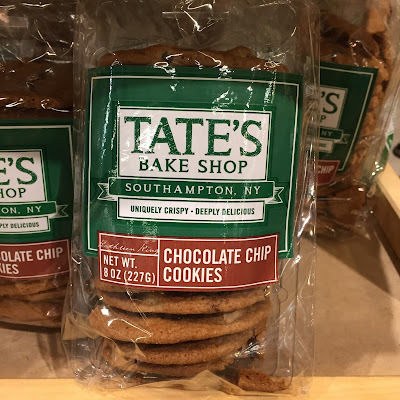 I have never had tates cookies before, but looking at your pictures I so want to taste them. Love how deliciously crispy and chocolaty they are. 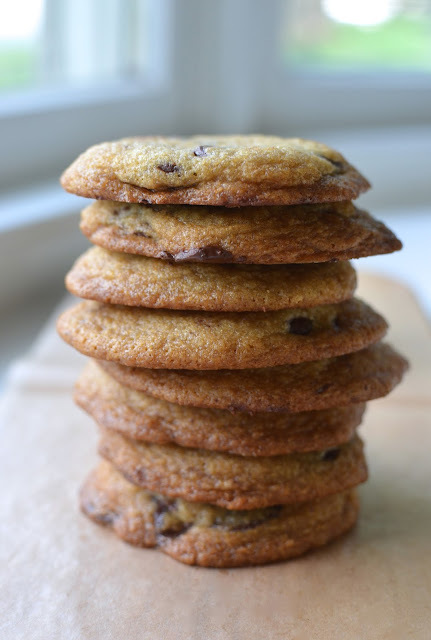 I always say yes to good chocolate chip cookies as these ones! I love to try new recipes! A crisp edge is very satisfying, agreed!